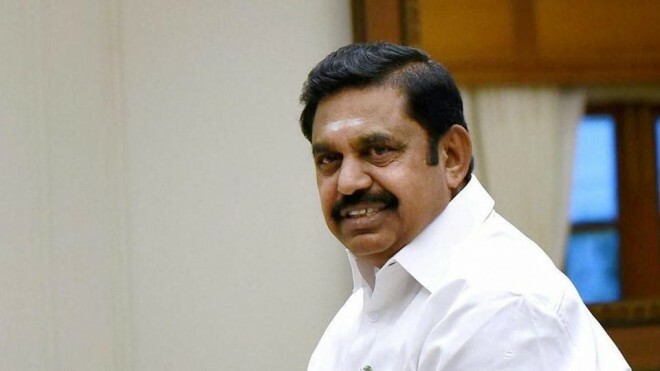 Karur, Apr 07: Tamil Nadu Chief Minister K Palaniswami Sunday said DMK president M K Stalin was not qualified to speak on the Cauvery issue since the party had failed to notify the final award of the Cauvery Water Dispute Tribunal in the Gazette. Palaniswami made the allegations while campaigning for M Thambidurai contesting from Karur and alliance party candidate PMK nominee S Jothimuthu from Dindigul. "It was only the government of amma, as Jayalalithaa was fondly addressed, which solved the Cauvery issue raging for decades. The DMK does not have the right to talk about it," he said. Palaniswami criticised Congress leader and former finance minister P Chidambaram for not allotting sufficient funds to Tamil Nadu. Had he allotted funds, several farmer-friendly schemes would have been implemented, the chief minister said. He said the Congress and the DMK remember the people only during elections and condemned the latter's manifesto for confusing the people to gain votes. Noting that farmers living in and around Karur and Dindigul were into cultivation of fruit and vegetables on a large-scale, he said steps would be taken up to set up a Rs 70-crore mega food park on a 10-acre land at Tharangambadi in Nagapattinam district to store the farm produce. "At this park, the produce will be sourced directly from the farmers who can store it free of cost," he added.